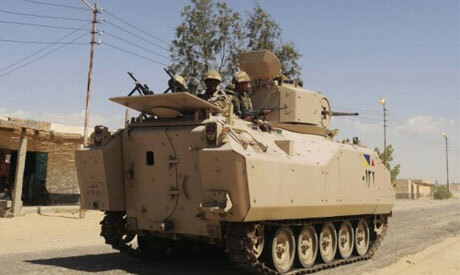 Seven military personnel have been injured in an attack on an armoured vehicle on Friday night near Al-Arish city in North Sinai, sources told Ahram Online. The injuried - five soldiers and two officers - were transferred to Arish military hospital. The nature of the attack is yet to be announced. Last Friday, 32 soldiers were killed in two attacks by unknown assailants in North Sinai, prompting the government to declare a three-month state of emergency in the area. The government also imposed a daily curfew from 5pm to 7am. The explosion happened during curfew hours. Earlier in the week, the government began to displace residents from a strip of territory in Sinai adjacent to the border with Gaza, to create a buffer zone in the area. The Egyptian army has been combatting a jihadist insurgency in Sinai in the last few years. Militant attacks against security forces increased after the ouster of Islamist president Mohamed Morsi in July, 2013. Hundreds of army and police soldiers have been killed in those attacks. The army also says it has killed hundreds of jihadists.